Remember that wonderful Mazda6 diesel race car? Mazda carried over the development from that car into a wonderful diesel-powered prototype racer. 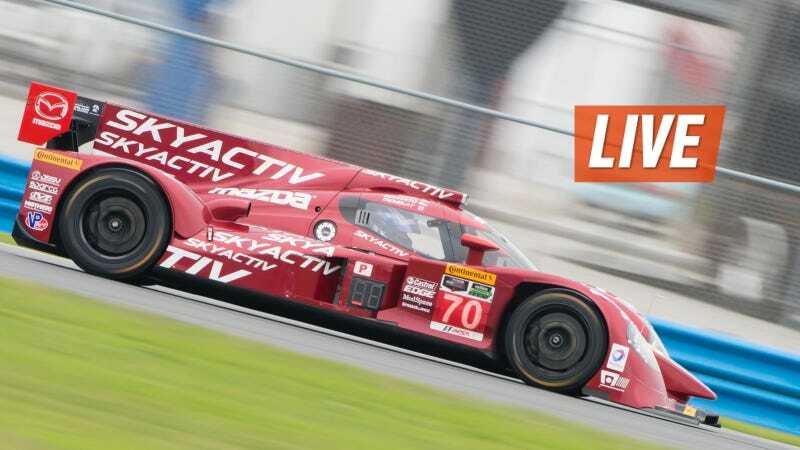 We've got Jonathan Bomarito and Tristan Nunez who are racing that prototype at the Rolex 24 here to answer all your questions. What do you want to know? The SpeedSource-run prototype is, admittedly, still in a "development year," per Nunez. It qualified 13th in the prototype class at the Rolex 24 at Daytona and 19th overall. It's hard not to fall in love with one of the most unique cars on the grid, however. What are they doing to get the car to the top end of the grid where it belongs? Well, that's why we brought the Mazda crew here today. Jonathan Bomarito was with Mazda for years until 2013, when he switched over to SRT. He nearly won the GT championship with SRT, so he's the right man for the job when it comes to developing this car. Tristan Nunez is the youngest race winner and series champion in North American road racing history. I'm...jealous, not going to lie.